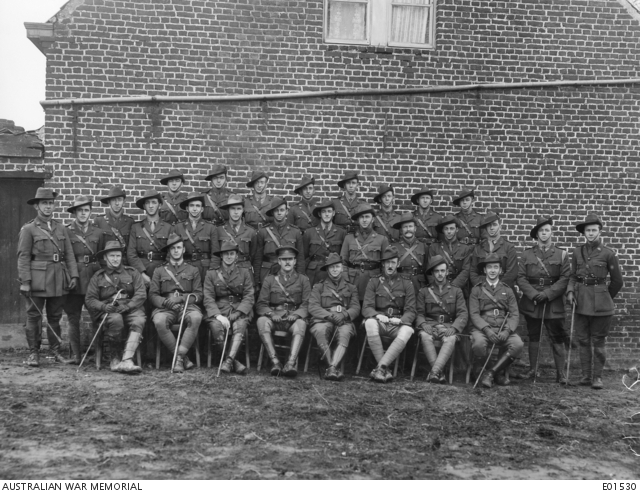 Group portrait of the officers of the 36th Battalion at Meteren in Northern France. Identified back row from left to right,: Second Lieutenant (2nd Lt) David Knight from Brunswick, Victoria (later died of wounds in France on 8 May 1918); Lieutenant (Lt) Charles Sydney Brandreth from Randwick, NSW; Lt Ronald Stanley Hobbs MC from Woolahra, NSW (died of wounds in France on 5 April 1918); Lt Ernest Clyde Barton from Wollar, NSW; 2nd Lt Noel Ainslie Paton from Blackheath, NSW; Lt Henry Joseph Watson from Newcastle, NSW; Lt John Roy O’Connell from West Maitland, NSW (later killed in action in France on 2 June 1918); and Lt Leonard John Jobson from West Brunswick, Victoria. Second row: Lt Frederick Albert Hayward from Riverstone, NSW; Lt Wilfred Newman Dann from Eastbourne, England; unidentified (slightly behind Dann); Lt Theodore Charles Macaw from Moonee Ponds, Victoria; Lt Harold James Cole from North Goulburn, NSW; Lt Alexander Henry Hocking from Mosman, NSW; Captain (Capt) William James Gordon MC from Rose Bay, NSW; Lt John Raymond Paul from Rose Bay; Lt George William Herbert Perkins from Stanmore, NSW; Lt John Perry Bradford from Lower Sandy Bay, Tasmania; Lt Herbert Reginald Mailer from Zetland, NSW; Lt Alexander Douglas Cameron from Hillgrove, NSW (killed in action in France on 4 April 1918); Lt Arthur William Townsend from Mallangance, NSW; and Lt Gordon Mott Cox from Nelligen, NSW. Front row: Chaplain Thomas Stanislaus Power from Malvern, Victoria; Capt Claude Esdale Prior from Artarmon, NSW; Major (Maj) Bert Burnell Rodd from Newcastle, NSW; Maj John Ambrose McDowell from Coogee, NSW; Capt Thomas Roger Macnee from Balmain, NSW (killed in action in France on 12 April 1918); Capt John Edward Wallace Bushelle MC from Sydney, NSW (killed in action in France on 6 April 1918); Capt Richard Gadd from Bronte, NSW; Capt Eric MacAllan Gordon Glassford MC from Kew, Victoria, Regimental Medical Officer (RMO). 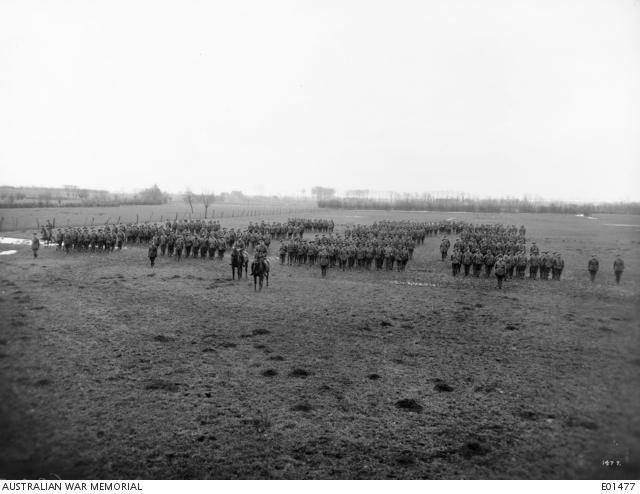 The 36th Battalion on parade at Meteren in Northern France. Identified, centre foreground are: Captain Thomas Rodger Macnee, Adjutant (slightly back) (killed in action 12 April 1918), and Major J. A. M. McDowell, Commanding Officer (centre).